Great images invite you into the universe of the unknown. Walking into Golden Gallery and Custom Framing gives a similar impact. Photos of different locations hung against the teal blue wall feels like a journey into a different world. Great images invite you into the universe of the unknown. Walking into Golden Gallery and Custom Framing gives a similar impact. Photos of different locations hung against the teal blue wall feels like a journey into a different world. An inviting white couch called my name when I arrived and soon Avram joined me to discuss his latest community project, the 3rd Street Star Bridge. 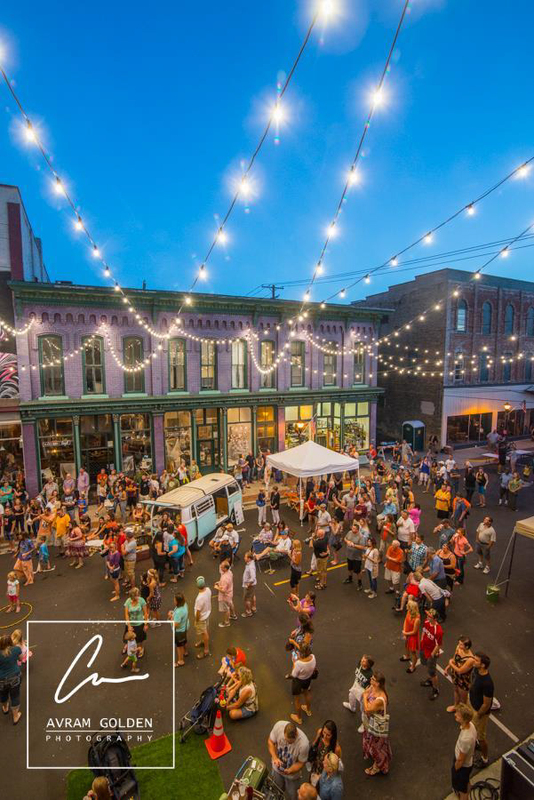 “I wanted to create a magical component for downtown,” Avram responded when asked about his goal for the project. His American Flag project, started in 2010, was his first act in enhancing downtown. Both projects were designed to help celebrate his brother, SFC Ari Golden’s service and to honor his life. He was a military man for 28 years. Ari passed away in December of 2015 and the Star Bridge Project was completed in July of 2016. 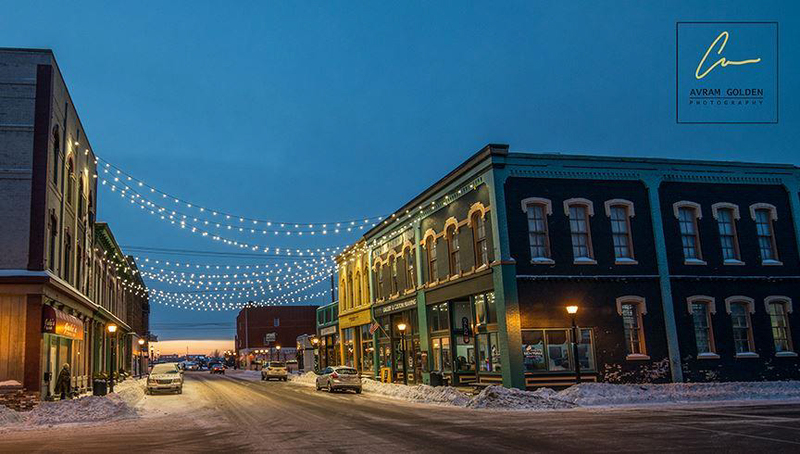 Avram set out to research types of lights that would work best for all of the seasons in our beautiful Michigan downtown. Those who donated money could recognize someone who’s been a light in their life, either living or passed. “The community really came behind [this project],” he said, as he noted how quickly the money was raised. Avram is no stranger to Bay City. He grew up here, and during our interview he named the schools he attended along the way. In fact, when he was trying to come up with the name for his project, Avram said he saw his old friend Peter Hardy (owner of Bay City Yoga) in Intermission Deli and together they came up with the name 3rd Street Star Bridge. A close connection between history and the present is found in the creation of our 3rd Street Star Bridge, as well as the murals that Avram helped organize on Third Street around the same time. The story of the Third Street Star Bridge is an interesting one. 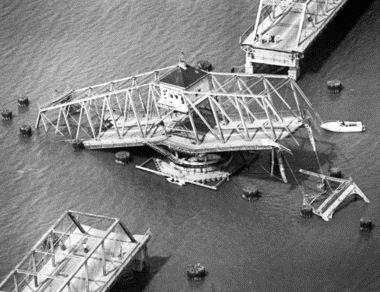 In 1976, the Third Street Bridge that connected the West and East side business districts of Bay City collapsed after being bumped by a passing freighter. The lack of a bridge was detrimental to the businesses on both sides of the river, causing some to close. I was curious about what lay ahead for the Star Bridge and Avram threw out a few ideas. Chalk walk is planned for under the Star Bridge and he “would like to see some interactive public art” in our community. One thing that Avram mentioned stuck with me: “What do you remember when you go to a city? If you’re a kid, you’re going to remember seeing those flags” and lights. His goal, “to create a magical and memorable experience,” is fulfilled as pictures pop up on social media of the 3rd Street Star Bridge. We are so fortunate to have such great attractions that people will remember after visiting Downtown Bay City.